Dinner, Lunch, Brunch, Special Occasions Plus Entertainment, Dancing, and Fun! 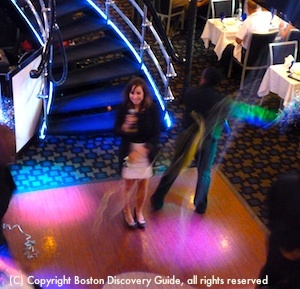 As soon as you board Spirit of Boston, you’ll know you’re going to have fun, as well as a spectacular Boston Harbor cruise. From the vibrant blue, orange, and green cushions scattered around comfortable seating to the sparkling 2-level dining decks wrapped around a central atrium and dance floors, everything about this luxury cruise ship is designed to make sure you have a wonderful time. You get to relax, watch ever-changing views as Boston's shoreline and the Harbor Islands go by, and of course enjoy a perfectly meal and beverages. Like her slightly more formal sister ship, Odyssey, the Spirit of Boston gives you the experience of being on a luxury cruise while dining, dancing, and touring the Harbor. Most cruises last 2 or 3 hours and include a lavish buffet meal - lunch or brunch at midday, and dinner in the evening. Chefs prepare the food in the ship’s large on-board kitchen, so it’s fresh and tasty. Bars on most of the decks and dining areas ensure fast and convenient drink service. 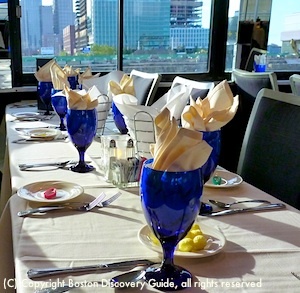 In addition to regular lunch, brunch, and dinner cruises, look for specialty themed cruises throughout the year: lobster clambake cruises, cocktail cruises, even a Black Friday dinner cruise on the day after Thanksgiving. 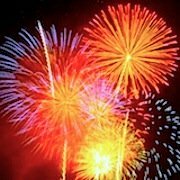 Almost every major holiday provides the occasion for special holiday cruises, including Spirit's memorable New Year's Eve Fireworks Dinner Cruise where you'll be dining and dancing under the stars, enjoying thrilling views of First Night Fireworks, and raising your glass for a champagne toast at midnight. The ship begins her Boston Harbor tour by heading up along the waterfront to Charlestown. You’ll see the lively downtown wharfs and Harborwalk, the North End’s older buildings sandwiched between lavish new waterfront condos, the soaring Bunker Hill Monument, and great views of “Old Ironside” - the USS Constitution. Almost equally interesting are views of East Boston's industrial waterfront . . . shipyards, old ferry berths, empty spaces once filled with factories, now slated to be future home to waterfront condos. Soon, the ship heads out to the Harbor Islands, bringing a dramatic change of scenery. A whole new world scarcely visible from shore opens up, and you realize how much you miss if you tour Boston only on land. A daytime lunch or brunch cruise lets you see sights more clearly, while an evening cruise features dramatic sunset views and the magic of sparkling lights. 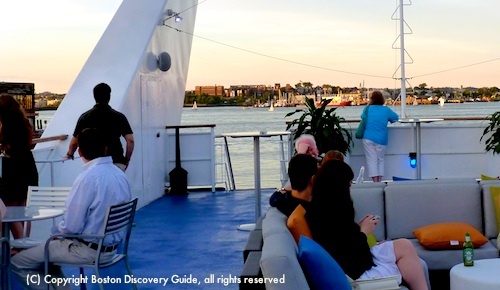 If you’re visiting Boston and want to see it all, you’ll get the fullest experience by going on both a daytime and an evening cruise - do one on Spirit and the other on Odyssey. Because both ships feature large climate-controlled interior spaces with huge windows giving panoramic outside views, they cruise year-round, almost regardless of weather. 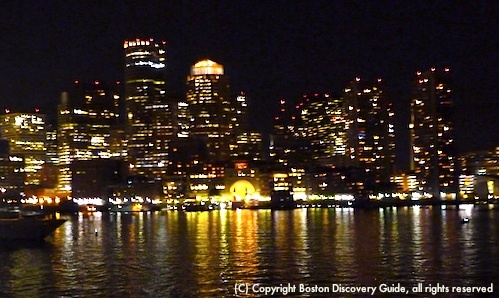 In fact, if you’re visiting Boston during the winter, you’ll appreciate how Spirit of Boston (and Odyssey) continues to operate, since most other cruises and many tours shut down until spring. At any time of the year, you can’t beat the experience aboard this special ship! "Can you believe these colors?!? I had no idea a sunset could look like this in Boston!" Our most recent Spirit of Boston cruise, memorialized in all the photos on this page, took place on a balmy August evening. Just Spirit pulled away from the wharf, the sun started dropping behind the Boston skyline, producing gorgeous sunset views across the water. With drinks and a few appetizers in hand, we headed up to the top outdoor deck and relaxed on one of the comfortable couches, enjoying the constantly-changing scenery. By the time we finally made our way to our table in the dining area, the DJ and performers were kicking off the evening’s entertainment on the dance floor. We enjoyed the delicious buffet dinner - nicely prepared entrees, a carving station, perfectly cooked fresh veggies, a large salad bar. The ship’s friendly staff provides excellent service, and we felt quite pampered. But the warm August night and sights from the decks lured us back outside - so we skipped dessert and relaxed on our favorite couch for the rest of the mellow evening cruise under the stars - a perfect “life is good!” evening. Temperatures on the water may be at least 10 degrees cooler than on land - so no matter how warm the weather, bring an extra layer to wrap yourself in if the temperature drops. 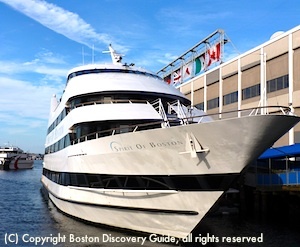 Spirit of Boston, similar to Odyssey, accommodates up to 600 passengers, making it one of the two largest cruise ships offering Boston Harbor tours. 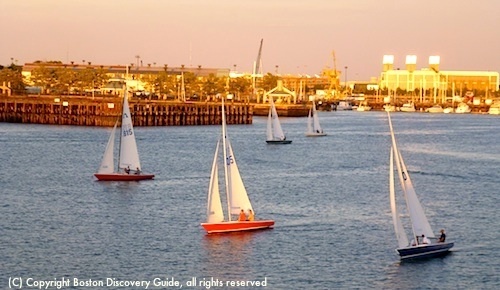 Because the ship stays within the protected waters of the Harbor, you can be assured of having a smooth ride. Spirit cruises depart from the Seaport World Trade Center Marine Terminal in the South Boston Waterfront neighborhood. It's almost directly across the street from the Seaport Hotel, and next to Atlantic Beer Garden. 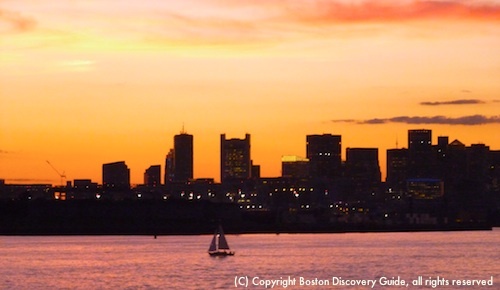 Although Spirit of Boston offers cruises on most days, weekends and holidays tend to book up quickly - so don't wait to make your reservations once you know your dates! Top Attractions - Be sure these are on your list!